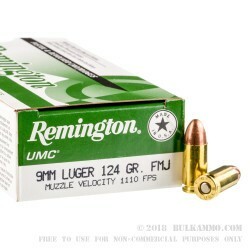 An absolutely incredible bulk rate for such a proven cartridge, the 9mm Luger UMC 124 grain FMJ ammo from Remington is probably now in close consideration for your new range shooting round based on price point alone. 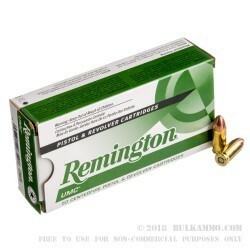 Lucky for you: Remington doesn’t need to compete on price alone. They’ve got a well-known brand name; a time tested design in the UMC line and can back up their claims with real world performance. 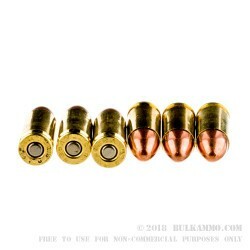 This load in the UMC line is a boxer primed, brass cased cartridge with a conical 124 grain 9mm projectile that feeds reliably in every 9mm known to man. A respectable 1100 fps velocity means you have the oomph to cycle the toughest of actions and the accuracy on target that will help you become a better shooter. And for less money than you normally spend. 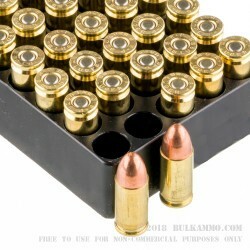 Reloadable spent casings; the reliability of Remington; clean burning powders and consistency you just cannot get with cheaper made alternatives (not many can even compete on price alone anyways), makes this load a perfect range companion for anyone looking to get more time out at the range without running dirty, less reliable ammunition.